INTER SCHOOL & COLLEGE CULTURAL COMPETITIONS conducted in 5 places. 1. Mysore Nagar level: On 6th September at Gopalaswamy High school, Nanjumalige. 187 students from 8 high schools and 7 colleges participated in Patriotic song, Essay on My India, Drawing and Elocution competitions. 3. Rural school competition at Bannur : On 13th September at Vakkaligara Bavan, Bannur, 178 students from 16 schools participated in Patriotic song, Essay and Drawing competitions. 4. Rural school Competition at Roopa nagar: On 20th September at Deepa school, Roopanagar, 60 students participated in drawing and patriotic song competition. 5. Competition for Anandalaya and Samskara varga students on 14th September : 43 students from 1 Ananadalaya and 3 samskara varga’s participated in Patriotic song, essay and drawing competition. SAMSKARA VARGA: 5 New samskara varga started at K G Koppal ( 87 students), Jayanagar ( 43 students) , Royal school ( 38 students) , Sriramapura ( 14 students) and Krishnamurthypuram ( 29 students). UNIVERSAL BROTHERHOOD DAY CELEBRATION celebrated at 2 places. 1. At Jayanagar on 11th September, 2014. Ma. C V Gopinathji, Retd. Additional Secretary, Govt of India and Sri N S Chakravartiji was Chief guests, Chief Engineer, B S N L, was Chief guests. Dr. A S Chandrashekarji, Nagar Sanchalaka presided the function, and Sri G M Laxminaryanji, donor was distributed the prizes for winners of competition. Sri N S Chakravartiji, talked about swami Vivekananda and vedantic message to west. Ma. Gopinathji talked about Ma. Eknathji’s 100 years birth centernery programme. 2. At Bannur on 19th September. 143 students and 23 teachers from Vivekananda Vidyalaya, Govt school bannur, c halli, Beedanahalli, Vani school, Kasturbha balika vidyalaya bannur, Rotary School bannur, attended the programme. Aravinda Prasad talked about Swami Vivekananda. 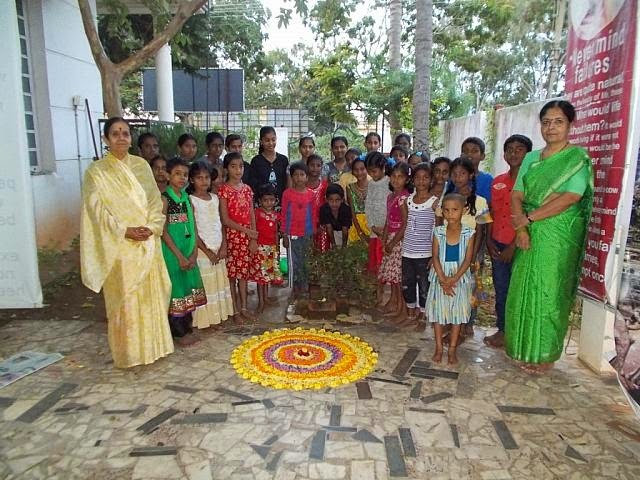 ONAN CELEBRATION: On 10th September, Anandalaya children and teachers celebrated onam festival at Kendra.